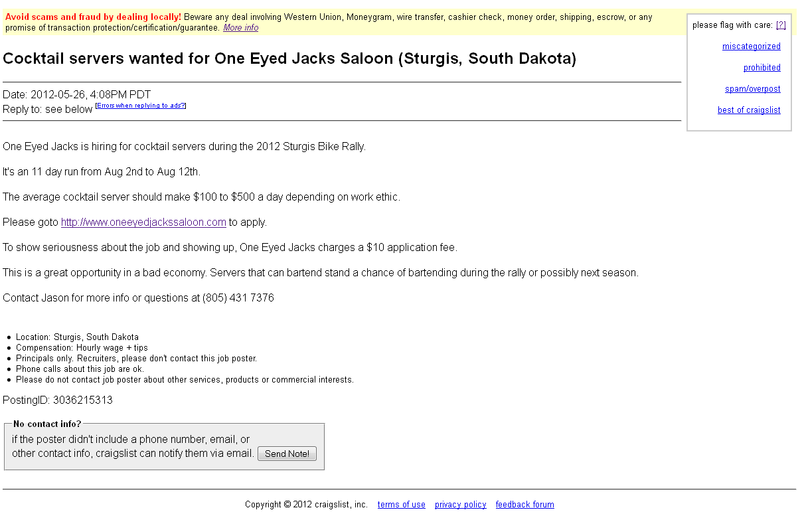 One Eyed Jacks is hiring for cocktail servers during the 2012 Sturgis Bike Rally. It’s an 11 day run from Aug 2nd to Aug 12th. The average cocktail server should make $100 to $500 a day depending on work ethic. Please goto oneeyedjackssaloon.com to apply. To show seriousness about the job and showing up, One Eyed Jacks charges a $10 application fee. This is a great opportunity in a bad economy. Servers that can bartend stand a chance of bartending during the rally or possibly next season. I love how they mention this being “a great opportunity in a bad economy.” Translation: We know you’re desperate for a job that pays enough to live on, and we’re going to take full advantage of your desperation.” Also note that they’re not charging the application fee to cover administrative costs for tests, background checks, or the like (not that that would make it okay). Nope, you’ve got to send them $10 via Paypal just to show that you’re “serious” about this job. And to top it all off, this isn’t even a permanent position. We’re talking about an 11-day temp job! Of course a visit to their website reveals that they’re charging the same $10 application fee for any part-time and full-time jobs that may or may not be available. Imagine if this became a trend. Apply to 30 jobs and you’re out 300 bucks. If you’re already impoverished, you can’t apply at all. And I can only imagine the scams. Got a business that’s not doing so good? You could easily make hundreds, even thousands, of dollars running ads for jobs that don’t exist. Hell, you don’t even need a business, though your scam will be more credible with a company name and website. Scams preying on the unemployed and underemployed already abound on sites like Craigslist, so this would be just one more thing to watch out for. This job posting, however, does not seem to be a scam. It appears that this employer is really seeking additional staff for an 11-day event in early August, and they see nothing wrong with charging workers for the “privilege” of filling out a job application. And the sad part is that in this economy, they’ll probably receive no shortage of applications. Note also that the ad is deliberately written to ensure they’ll receive as many applications–and $10 fees–as possible. If your goal was to weed out unsuitable applicants and time-wasters, you’d include a detailed list of qualifications applicants MUST possess in order to be considered for the job. This ad, however, doesn’t mention job qualifications at all. 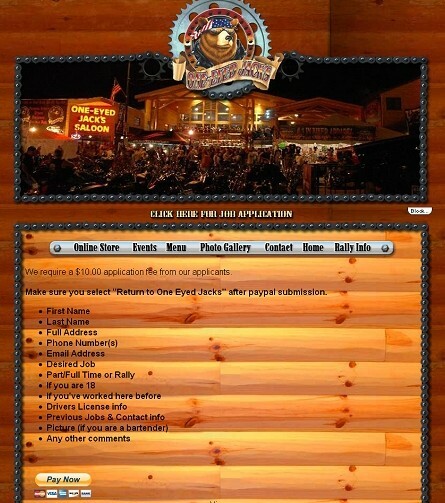 Will One Eyed Jacks consider applicants without waitressing or bartending experience? How about male applicants? Or female applicants who aren’t comfortable strutting around in skimpy shorts and a bra top–or lack the requisite “hot bod” to do so in a way approved of by Dude Nation? I won’t venture a guess as to the first question, but judging from the website’s photo gallery, I’m pretty sure the answer to the other questions is a big fat no. My partner suggested that maybe they charge an application fee because they have a lot of no-shows when women realize they’ll be working a biker rally instead of a swanky resort casino, but I don’t buy that. The Sturgis Bike Rally is famous and since job seekers must visit the saloon’s website to apply, it would be tough to miss that this is a biker joint. Also, speaking from personal experience, I’d much rather serve drinks to bikers than Wall Street bankers. On a somewhat related note, we are still jobless and workless and trying to make the June rent, so if you’ve got a little extra to spare, we’d REALLY, REALLY appreciate it if you’d send it our way. Bikers can sometimes be rough customers, but at least they’re up front about it. Say, what do you think the owners are planning on charging the women who make it past the first round of interviews? Much as I like the logo and the name (yay for Twin Peaks and surrealistic westerns! ), my mind boggles at the sheer gall it must take to charge applicants to apply for a job. WTF? Imagine if this became a trend. Apply to 30 jobs and you’re out 300 bucks. If you’re already impoverished, you can’t apply at all. A truly frightening thought. But hey, if you’re a discerning employer who doesn’t want to waste time interviewing all those unwashed rabble you wouldn’t hire anyway, all the better to keep the riff-raff out! It’ll also help make sure the low class vermin don’t accidentlally infilatrate any jobs. This way, they can either starve and quit bothering people, or commit crimes, get caught, go to jail, and help prop up the prison industry. We really need all those correctional facilities to do a bustling business–they’re one of the few employment bright spots in today’s economy! Yeah, I know, the biker bar that gets lots of people wearing “Support Your Local Mongol” t-shirts every year is not the sort of place that would be wanting to prop up the prison industry or look down on the misfits to the extent I just described, but I can totally see this sort of thing being applied to a wider range of jobs if enough people apply to them. I wonder if it would be possible to organize some sort of boycott of them until they rescinded this policy?